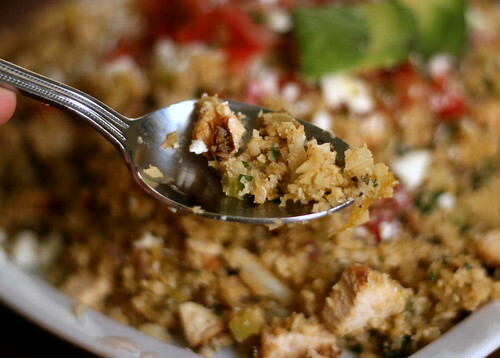 Chicken and cauliflower rice is one of my favorite weeknight meals now. It’s super easy and pleases all kinds of people — the paleo, keto, Whole30, low-carb, gluten-free, grain free. And probably your mom. Cauliflower rice is an interesting thing. As you might guess, there isn’t any rice in this dish. What is “rice” made of, then?Cauliflower. Itty bitty pieces of cauliflower. About like this . . . Ya, Mom, this is one of your motorhome bowls. I somehow ended up with it after our trip last summer. This turned out great, by the way. And no, I don’t think it had a cauliflowery taste at all. The texture was good — a little more bite than rice. Similar to brown rice maybe. The baby ate it happily, but the toddler was in a “mood”. This would be great for someone who’s trying to reduce their carb or starch intake as it’s essentially a pile of vegetables with a little protein. 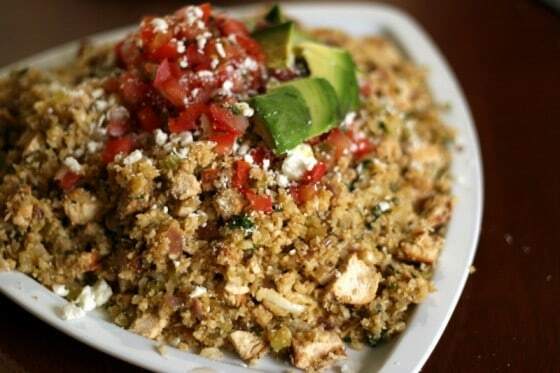 As I stared at the mound of chicken and cauliflower rice it started to remind me of stuffing. 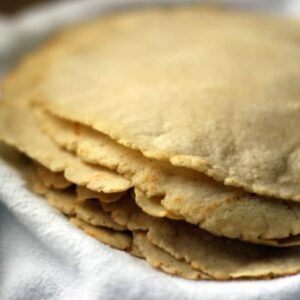 Then I thought that with a tweak of ingredients, this would be a great gluten-free alternative to stuffing! Maybe I’ll work on that for this fall. 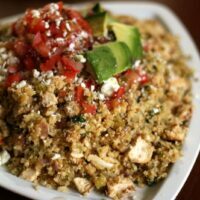 . .
Mexican Chicken and Cauliflower Rice is a super easy and healthy weeknight meal -- and you might even convert some cauliflower haters! In a large skillet, heat olive oil over medium heat. Add onions and over medium heat for 10 minutes, until soft. Add celery to skillet and saute for 5 minutes more. 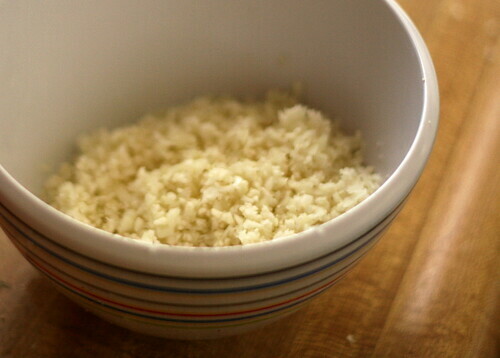 Meanwhile, place cauliflower in a food processor with the "S" blade and process until it becomes the texture of rice. Add cauliflower to skillet, cover and cook 5-10 minutes, until tender. Serve, topping with avocado, cheese and salsa if desired. Nat's Note: For the chicken, I made a quick marinade mimicking the spices in the dish (olive oil, lime juice, chili powder, salt & pepper). I put the marinade in a zip top bag with the chicken and left it in the fridge overnight, then grilled it as my husband was making the "rice". That is ingenious. I so have to try this! I've been really noticing the versatility of cauliflower lately. I few weeks ago I roasted some and used it in a creamy tomato soup, in place of the cream. It gave a silky texture and slightly creamy flavor without, you know, having cream. It's awesome! This sounds like a tasty rice dish! wow, how smart! I'm always trying to find ways to sneak veggies into Josie's food. This looks yummy. Tried it and loved it! I like that it isn't too filling the way rice can be sometimes. Yay for more veggies. I only wish we had had cotija, pico, and avocado. Asher decided that it's good with green olives though (his choice, not mine…kinda salty). 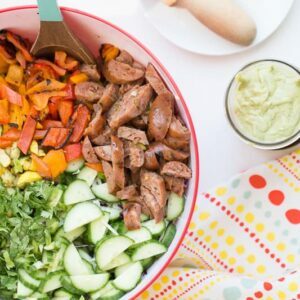 Pingback: Perry's Plate: Progressively Paleo Recipes » A Few of My Favorite Things + $50 Noonday Collection Giveaway!